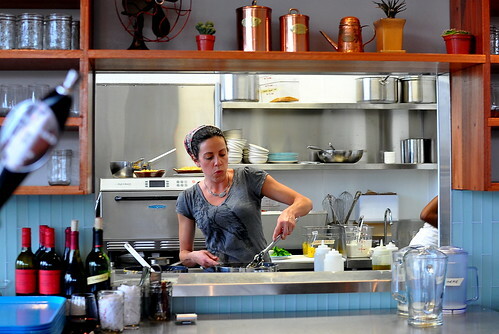 About a year ago today, my friend Allison announced on her blog Local Lemons that she was opening a restaurant in Oakland, California. Together with her friend Erin, she planned on launching a casual and unfussy joint serving ooey gooey, perfectly constructed, locally-sourced macaroni and cheese. 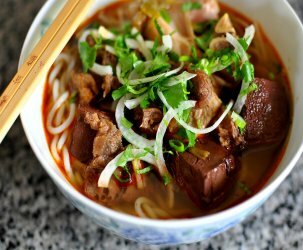 Truly, one of the most comforting dishes ever. 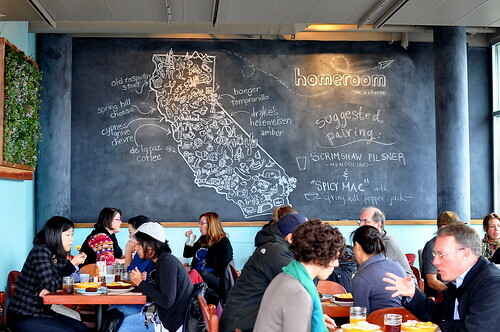 I followed the restaurant’s progress from start to finish, and as luck would have it, my recent trip to The Bay Area coincided with Homeroom‘s grand opening. I was stoked like you wouldn’t believe to not only reunite with my friend, but to see her dreams come to fruition. The Astronomer and I lunched at Homeroom on its third day of business along with my friend Sandy a.k.a The Foodhoe. The weather was downright nasty this afternoon, but that didn’t stop the entire neighborhood from seeking comfort in carbohydrates. The place was completely packed. 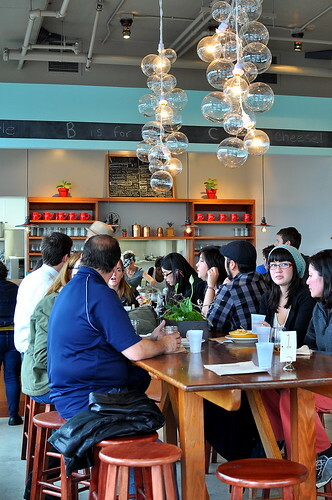 Everything from the communal tables to the light fixtures and chairs were built by hand by Allison and company. The space was smartly designed and tinged with a bit of nostalgia. 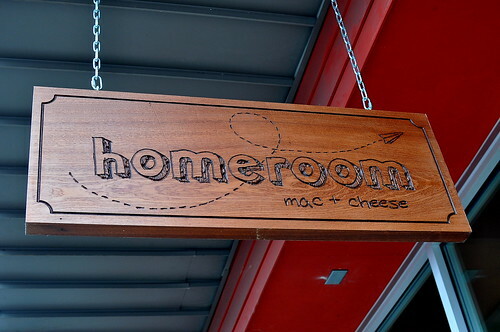 It felt warm, inviting, casual, and fun, just like homeroom. 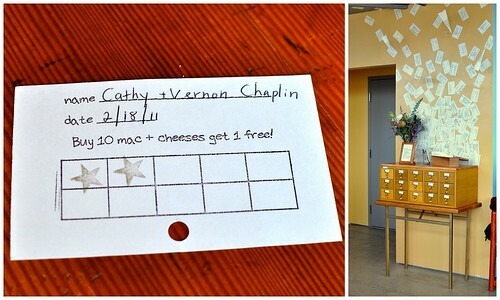 Playing on the old school theme, the restaurant’s customer loyalty program rewards frequent diners with gold stars and a free mac and cheese with ten purchases. All of the cards are stored in a vintage card catalog inside the restaurant. It’s little details like these that make Homeroom look and feel quite special. After waiting in line, placing our order, and paying for our goods, The Astronomer and I were handed a numbered placard and instructed to grab a table. Moments later, a cool glass of homemade root beer arrived ($2.50). 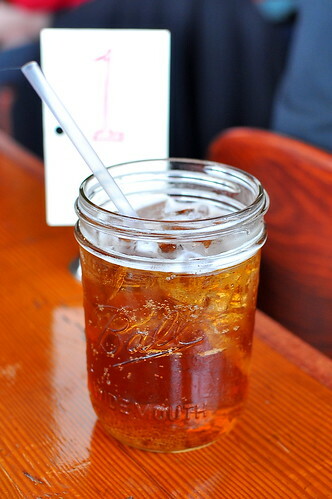 It was served in an old-fashioned mason jar. The root beer’s light color and smooth flavor was reminiscent of cream soda. The macaroni and cheeses arrived a good while after the drinks did due to the massive crowd, but we didn’t mind because all that’s delicious is worth waiting for. The Astronomer ordered “The Exchange Student: Cacio e Pepe” ($7.50), which was made with sharp Italian Pecorino mixed with cracked black peppercorns. The Astronomer thoroughly enjoyed the rich and creamy casserole, especially the bites with plenty of pepper. After years of reading Sandy’s food blog, I had a sneaking suspicion that she would order the “Trailer Mac” ($8.50). 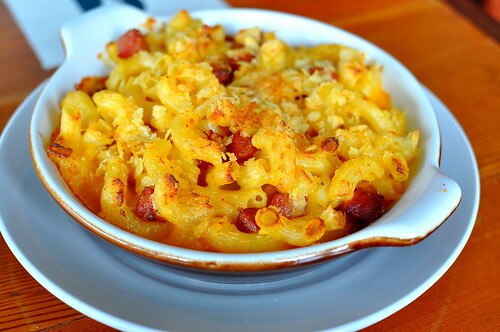 The down home creation paired cheddary macaroni with slices of Prather Ranch hot dogs. 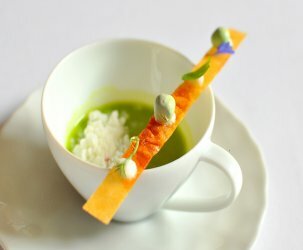 The entire dish was topped with crushed potato chips. “Trailer Mac” sounded like a bit of a disaster on paper, but in real life, it was friggin’ tasty! My friend was extremely happy with her choice, and I was extremely happy that she shared a good heap with me. Who knew crushed potato chips would make such a fine crust? I ordered the breakfast-inspired “Bacon, Egg and Cheese” ($10). It was made with extra-sharp cheddar, Star Meat’s house-cured bacon, buttery breadcrumbs, and topped with a runny fried egg. ‘Tis impossible to go wrong with such a right-on combination of ingredients. To round out our meal, we ordered two vegetable sides. 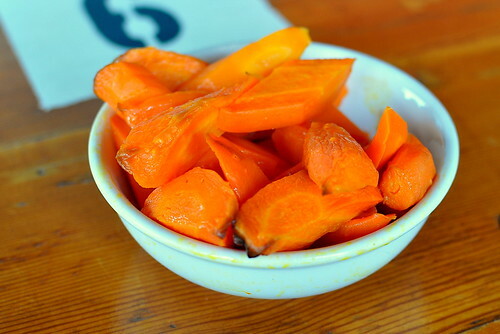 The roasted carrots ($3) were served too cool for our taste, but their natural sweetness was to our liking. 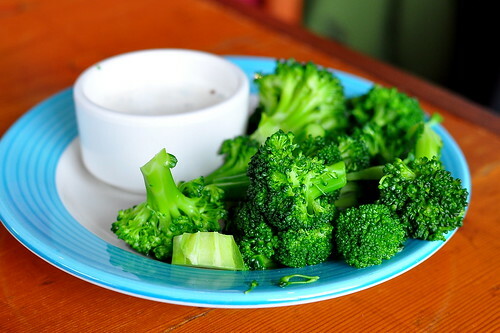 The blanched broccoli with homemade ranch dressing ($3) was served cool as well, but to better effect than with the carrots. The bushy florets were a fine vehicle for the totally yummy dipping sauce. For dessert, The Astronomer and I shared a homemade Oreo topped with sea salt ($2). 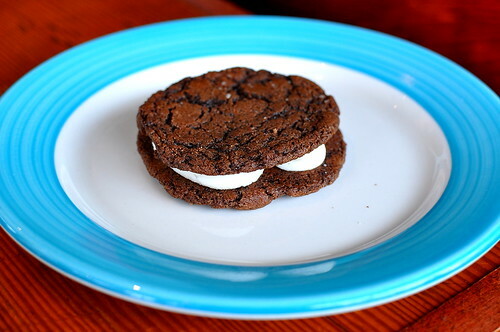 Gourmet Oreos are all the rage these days, and the ones at Homeroom are a delightful homage to the original. 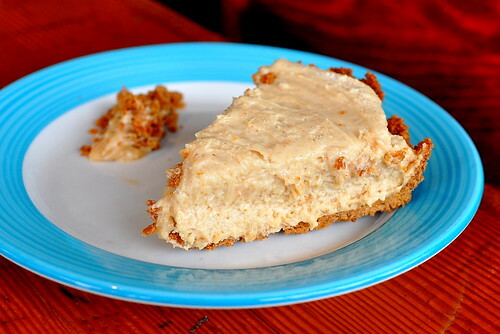 We also indulged in a wickedly decadent slice of creamy peanut butter pie with a crumbly graham cracker crust ($4). Mmm, boy! 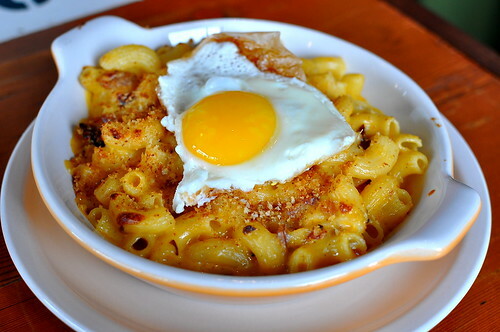 This looks really interesting…it just screams homey comfort food! The Trailer Mac and Bacon, Egg, Cheese are two that I’d totally try, in particular. 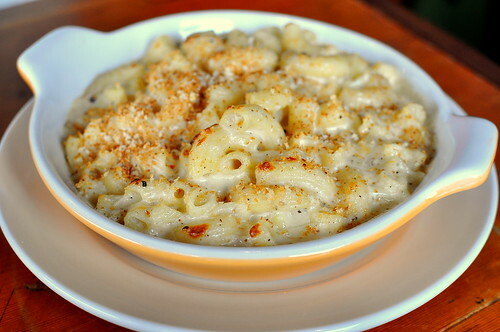 This DOES sound interesting…a place dedicated to mac and cheese….sounds delicious! It’s refreshing to see a place with almost everything entirely homemade with creative ingredients. Everything looks delicious. I wish I lived out west and could try it. This sounds truly amazing. I’m hip deep in cramps and it’s a gross rainy day soooo I think we have some mac n cheese along with some add ins available. To the kitchen! 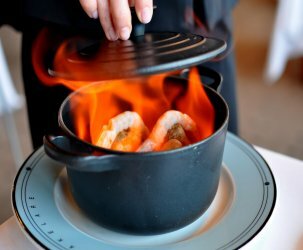 A restaurant revolving around creative versions of macaroni and cheese? Why oh why is this 3,000 miles away from Boston?! Sounds fantastic :). DTAB is mighty proud of you for getting some veggie sides with your mac! Sounds like a truly special place — I wish Oakland were closer! Very cool. I love hearing about people making their dreams come true. I wish them much success. Cathy, Thanks again for inviting me to tag along, I had the best time! And now I’m craving that PB pie, and there’s noting wrong with dessert first… It was great to see you! Whoa, I used to love Kraft’s Mac & Cheese with hot dogs. Trailer Mac FTW! Tsz – But you never lived in a trailer?! Maybe I should get Allison to change the name to SGV Mac? !